The pH Gender Scale measures how gendered a social structure, an ideology or a cultural production is. The more it tends to the acid, the more gendered the sample is. 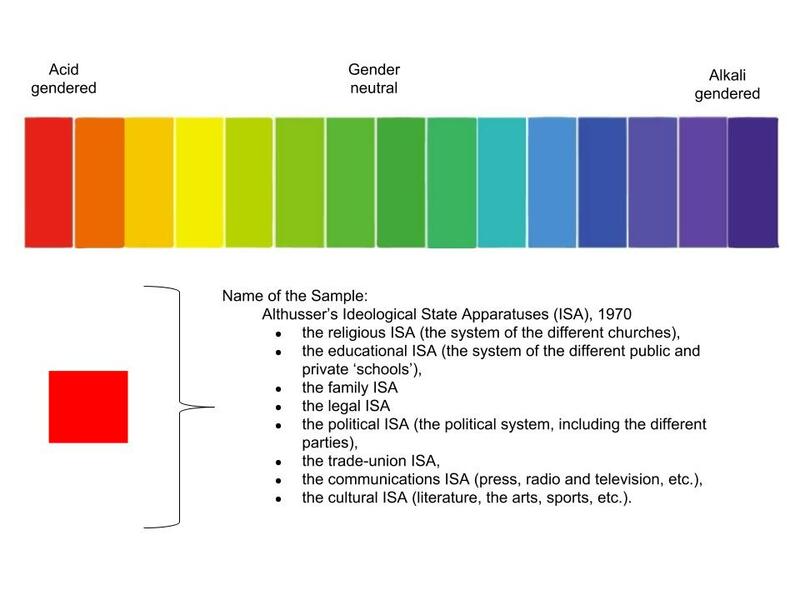 In this case, the samples are the Ideological State Apparatuses suggested by Althusser in his essay “Ideology and Ideological State Apparatuses (Notes towards an Investigation)” published in 1970. Through this piece, it is communicated that social structures and cultural systems are highly gendered. This contravenes the patriarchal myth that proclaims that socio cultural constructions are gender neutral, obscuring and under covering the sexist structures that supports them.